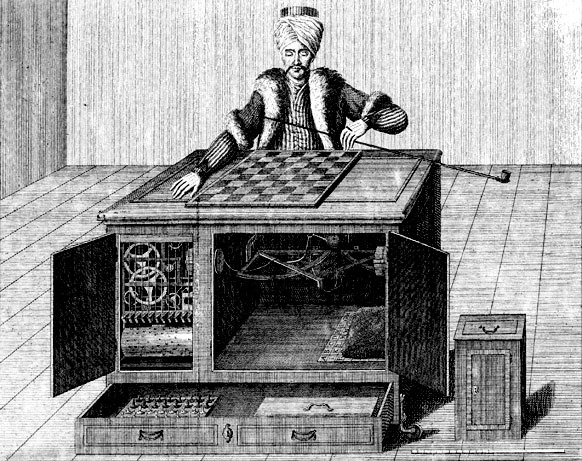 Continuing our journey through antiquity, we hit upon the story of the mechanical turk, a chess playing automaton peddled around the courts of Napoleon and other illustrious figures. Oh yeah, and it turns out that it wasn’t really a robot, just an elaborate simulacrum hiding a chess-playing midget. Amazon’s Mechanical Turk website is another example of artificial artificial intelligence. You submit a task broken into manageable chunks and offer to pay a small amount for each chunk. Check out the students’ projects on their homepages. Using computers to do things!